Build Your Own BP Liberator Hand Truck - $199.99 Incl. Shipping. Designing your own custom BP Liberator hand truck has never been easier or cheaper! Handtrucks 2Go brings you the best price on a Build Your Own Liberator hand truck with a starting price of just $207.99 Incl. Shipping, for the basic package. Extra charges for upgrades and optional accessories. Transporting kegs? 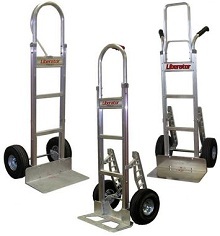 Click here for the Liberator Keg Hand Truck, or here for Liberator replacement parts. • Ships Unassembled - Includes all hardware needed for assembly. Simply scroll down the page choosing the parts you want by selecting the box with the part of your choice. Please Note: The height of your hand truck is dependant on the handle that you choose. Standard Loop with U-Brace and comfort sleeve. Straight Loop, Vertical grip at 52". Multiple grip locations, horizontal bar at 46"
Square loop-straight back, double vertical grips at 43 5/8". Center vertical bar. Straight loop, flared double grips at 46". Straight loop,straight back, double vertical grips at 43 5/8". 55" height. Straight loop,straight back, double vertical grips at 43 5/8". 62" height. Straight loop, pin grip at 46". High Performance Dark Gray Non-Marking. ULTRA LIGHT & ULTRA STRONG HIGH ROLLABILITY, EXCELLENT SHOCK ABSORPTION AND AN EXTREMELY DURABLE HUB. Non Marking. Polypropylene hub. Extremely durable and lightweight. Hub design keeps tread on, even when damaged. Aluminum Cast Stair Climber with Wear Strip, Per Pair (Includes hardware). Extruded Aluminum Stairclimber w/Heavy Duty 1/2" Wear Strips, Per Pair (Includes hardware). Same as E1L but vertical geometry functions far better than angled designs. Requires less driver effort to go up and down stairs. Please Note: Frame Extensions Are Only Compatible With Handles A1, A13, And A11. Brings the height of the hand truck to 52"for taller loads. 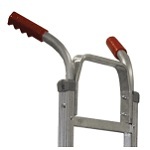 Brings the height of the hand truck to 55" for taller loads. Brings the height of the hand truck to 60" for taller loads. Brings the height of the hand truck to 68" for taller loads. Please Note: The 4 Wheel Attachment Is Not Compatible With Stair Climbers. Takes the load off the operator, lightweight-only 8 lbs. High quality smooth rolling casters. Please Note: This option will not work with Rear Mount Noses in Step 3. Ideal for anyone delivering in tight coolers or store aisles, Only 14" wide with 2 1/8" wide wheels. Excellent hand truck! I use one at work every day to deliver. I thought it was time I had one for home. Advantages: Light wait and easy to use. Very durable and well constructed! Disadvantages: I can’t come up with any disadvantages! Website was easy to use. Lots of options for just about any application. My employees love it. It makes their job much easier with the one we received over the one that we were using. Advantages: Looks like it will do the job. Disadvantages: We had to assemble. 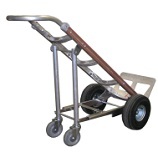 Please note that if you are ordering 10 or more hand trucks we can ship it assembled. The ability to design the hand truck the way I needed is greatly appreciated. As an assembly tip, if you ordered stair climbers and/or the fold down extension leave the wheels off until the last. I have a Cosco 3-in-1 aluminum hand truck as well and this Liberator is in another league. The Liberator is in the major leagues and the Cosco is playing high school ball. You can feel the Cosco truck begin to flex and sway carrying a 150 lb load but the Liberator stays rock solid far beyond this weight. If you're new to hand trucks get the no fill (foam filled) tires. There is nothing more annoying than going for your hand truck and discovering you need to fill your tires. Advantages: - Extremely solid and well built. - Ability to customize the truck to your needs. Disadvantages: None, regarding the hand truck, it's a beast! Although the assembly instructions are quite good there should be a cover sheet telling the user to keep the wheels off until after stair climbers and the fold down extensions are assembled. Not a big deal but it would be helpful. Same consistent high quality from BP Liberator. Design your own truck, efficient website, easy to assemble. Built for life. It's a Liberator, just do it. Assembly is easy if you follow instructions. Great handtruck, was able to build exactly the handtruck we needed. When we need another handtrucks 2 go will be our first stop. Advantages: Built what we needed. Our movers...Joyce Van Lines used this product exclusively during our loading and unloading. I had the opportunity to use one of them myself and was very impressed at how much easier it was to use compared with my Big Box steel unit. My wife and I liked it so much we decided to order one! It is a good investment that we will use for many years. Advantages: Ease of use...Weight....and the ability to spec one out for exactly what I needed from all of the options available. Very happy with the build quality and the construction of the handtruck I purchased. Instructions were super easy for assembly the construction actually used captured nuts on several parts, which made assembly that much easier, instead of having to hold a wrench on one side and tighten the other. Advantages: Much more light weight than my other handtrucks. The Fourth Wheel kit now locks into place either up or down and is more secure than prior models. Disadvantages: Should have picked out a larger blade. Had to assemble it myself, would have paid more if the option for assembly was available. If it was, I missed it. THESE WERE VERY GOOD AND STRONG. IN PAST WE HAD A LOT OF ISSUES WITH TIRES AND PLATES. NOT THESE, THEY ARE STRONG ENOUGH FOR THE HEAVY FURNITURE AND MARBLE WE MOVE AROUND A 250000 SF WAREHOUSE.